This is the city (sort of). It’s a city of crime (and publicity stunts). Her name is Abigail Moore, and she carries a badge. 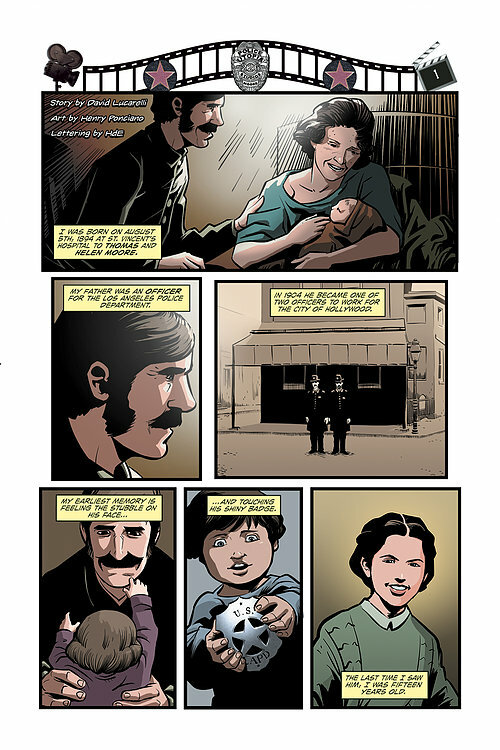 Like her father before her, Abigail wanted to serve, to protect, and to make a difference in the world of the early 1900’s as an officer of the law. It wasn’t easy for a girl to get the respect she felt she deserved in those days, or to get the chance to legitimately earn that respect. But with pluck, determination, and a nice pair of “gams”, Abigail gets her opportunity… or maybe the chance to get a opportunity. Hiring on as an officer for Utopia City Studios, the “city of the future”, is her best shot at following in her father’s footsteps. I like parallels. And once I read the lead in to this title, I found one jumping out at me in the forward from Tinseltown’s creator and writer, David Lucarelli. 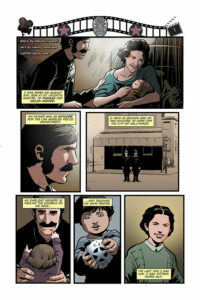 Lucarelli tells the story, the inspiration for this very comic, of his own mother, Officer Miriam Lucarelli. Beginning her career in the early 80’s, Officer Lucarelli served with the Pittsburgh Police Department for over twenty years, with obvious challenges and hurdles to overcome in law enforcement even then. It was thinking about those obstacles that got her son David pondering about what it must have been like for the first women to pin on a badge and walk a beat. Welcome to Tinseltown, owned and operated under the growing influence of the fictitious Utopia Studios. A city unto itself, Tinseltown has all of the problems of any other budding metropolis, all complicated by the “image first” attitude of any major movie studio. To deal with the day to day shenanigans, Utopia Studios puts out a “casting call” to fill all of its open positions, including patrol officers to walk a beat and keep the peace. I mentioned parallels before, right? Do you see it yet? 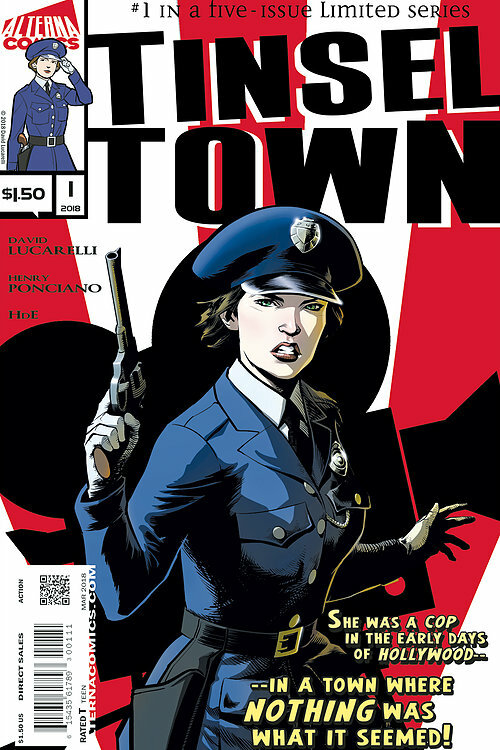 Tinseltown is a plucky new comicbook determined to make its way in an industry ruled by clashing titans and omnipotent overlords, about a tough young lady determined to make her way in a world run by dismissive bosses and overbearing men. 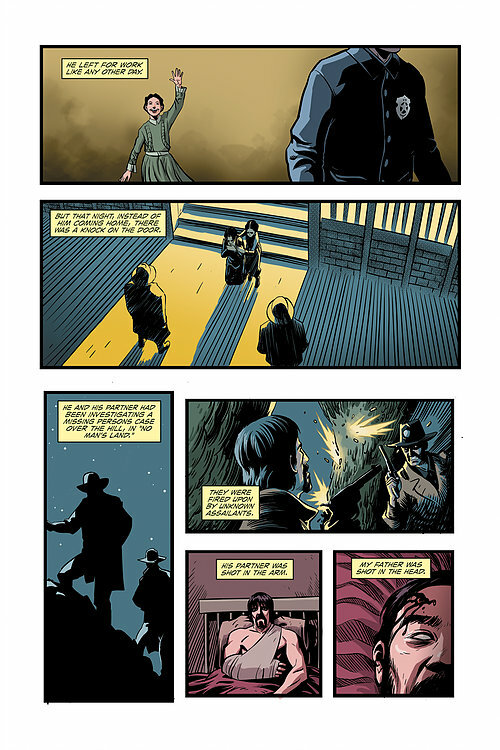 David Lucarelli should get a medal for pitching a perfectly understated comic that doesn’t involve superheroes, time travelers, or inter-dimensional despots. Then he should be sainted for actually getting it to print (crap, I think it’s three miracles required for sainthood… sorry, David). Tinseltown is a quiet title (so far…), populated by men who still believe the suffrage movement is just a fad, a publicity stunt to draw in the crowds, and women who either “go along to get along” or bite down and march on. Lucarelli gives Abigail Moore just enough naiveté to be shocked at the suggestion that she show some more leg, and all the guts she needs to push on through the misogyny with her head held high. I can only wonder exactly how much of Officer Miriam Lucarelli has found its way to the pages of her son’s book. 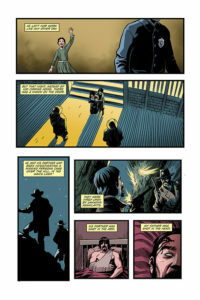 Now, a comic just isn’t a comic without pictures, and Tinseltown has ‘em. 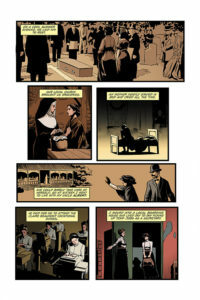 As challenging as Lucarelli’s job was to write an understated story set in the early 1900’s, Henry Ponciano’s job couldn’t have been any less daunting. No larger than life superheroes flying through the air, tossing cars around like toys and shooting lasers from their eyes will be populating this title (but judging by the guy’s deviantart page, he’s got no problem doing larger than life as well). Instead, Ponciano’s focus here is on real people doing real things, and wearing plain old ordinary clothes. In that regard, he’s doing a fine job. It can’t be accidental that we see Abigail’s shock and embarrassment at an overly tight uniform with a higher than normal hemline. 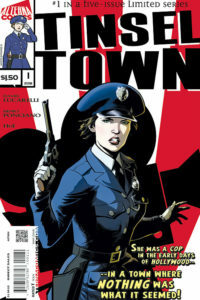 Or the expression of wry amusement from Tinseltown’s Chief of Police, the cynical and sharp-tongued Miss Redwood. Everything we need to know about these characters is right in front of us, in their facial expressions (the only one I’m not too sure of is Frankie… that guy’s way to chipper to be genuine), and it’s a testament to Ponciano that he’s able to pull it off as an artist. At this point, Officer Moore hasn’t faced anything more challenging than some catcalls, so we’ll have to wait until issue 2 to see if she’s given some really heavy lifting. 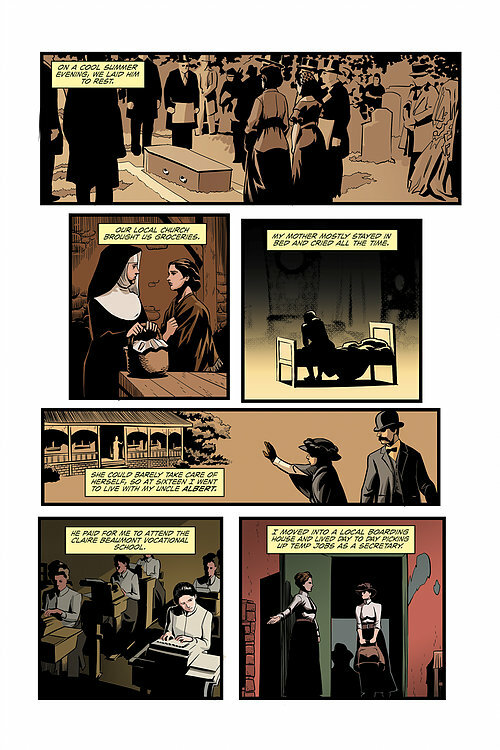 And there’s the hook- the third miracle to qualify Lucarelli for sainthood, if you will- I want to read on and find out how she does, lack of rampaging mutated anti-heroes be damned.